Cleveland, city of light. City of magic! Italics indicate sarcasm. I don’t know if it was ever clever to mock Cleveland but today it seems petty and predictable. When I visited the city on the lake last month, I saw only two parts: The airport and downtown. 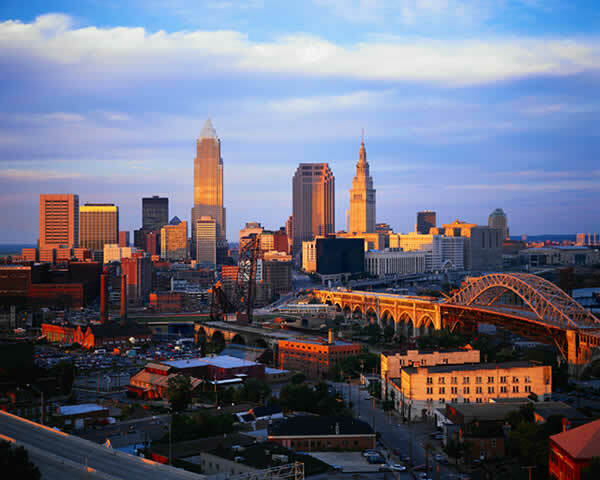 Airports look the same no matter where you are, and downtown Cleveland looked… not bad. That might be faint praise but I hold downtowns to a high standard. San Diego is an example of one central city that’s seen a tremendous amount of redevelopment and it shows. It’s also lucky enough to sit on a beautiful bayfront to which the shores of Lake Erie don’t compare well. Downtown Cleveland is home to sports stadia and a bustling commercial district. The blocks that surround the civic center look old and elegant. But nobody seems to live in downtown Cleveland, which means it’s mostly deserted at night. The property on the edge of downtown looks ragged and I saw what looked like a lot of empty office space. I remember once driving through the outskirts of Cleveland many years earlier on my way to Indiana from Rochester, New York when I was in the men’s room of a restaurant and heard a voice say, “Tom Fudge?” It was a buddy of mine from college, originally from New Jersey but who’d settled in Cleveland. I hadn’t seen him in years. I sat at a table with his family and mine at the suburban chain restaurant and got caught up. Last month in downtown Cleveland I got up at 430 am (130 PST) to catch a cab from the hotel to the airport. A homeless woman shouted for my attention out on the street while the hotel valet called the police. Cleveland isn’t all Rock ‘n’ Roll Hall of Fame. This entry was posted on July 3, 2013 at 4:29 am and is filed under Uncategorized. You can subscribe via RSS 2.0 feed to this post's comments. You can comment below, or link to this permanent URL from your own site.